V8 juices come in a variety of flavors and combinations. The original vegetable V8 is a combination of eight vegetables, but the company also produces high-fiber mixes, as well as fruit juices. If you don’t like to eat vegetables and don’t have the time to make your own fresh juices, V8 can offer a simple and quick alternative. According to V8’s official website, an 8-oz. serving of original V8 juice counts as two servings of vegetables. However, juices should not be used as a replacement for fresh, whole vegetables. According to nutrition expert Dr. Timothy S. Harlan, who runs the Dr. Gourmet website, V8 and other vegetable juice cocktails are not a good nutritional choice when compared to the whole fruit or vegetable. Drinking juices is better than eating not vegetables at all, but it’s best if you combine juices with fresh produce. 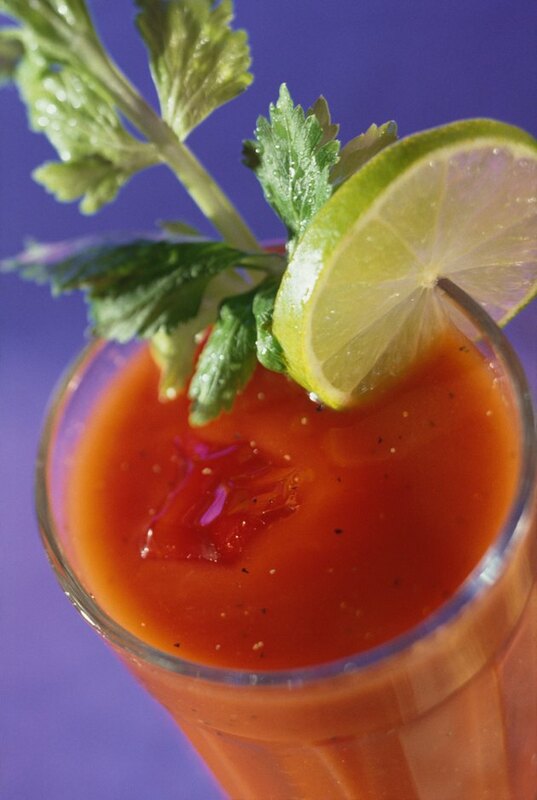 V8 consists primarily of tomato juice, with seven other vegetables added to provide additional nutrition and flavor. Those other five vegetables include beets, celery, lettuce, carrots, spinach, watercress and parsley. A single small tomato contains about 1.5 g of fiber. Add to that the fiber you would get from the other vegetables if you ate them raw, and your fiber content could be several grams. However, an 8-oz. glass of V8 contains only 2 g of fiber. V8 contains vitamins and other nutrients, but the amount is lower than you would find in the whole vegetable. An 8-oz. serving of V8 100 percent vegetable juice contains 40 percent of your daily requirements of vitamin A and 120 percent of vitamin C. However, there aren’t other vitamins present, such as E or folic acid, which you would find in fresh vegetables. V8 juice is high in sodium. The original vegetable variety contains 420 mg of sodium. This is about 20 percent of the maximum recommended amount for adults, which is 2,300 mg per day. Fresh vegetables contain very little sodium. For example, a raw tomato contains 3 mg of sodium. CBC News: How Much Sodium Do I Need? Is Juicing Raw Vegetables Good for You?